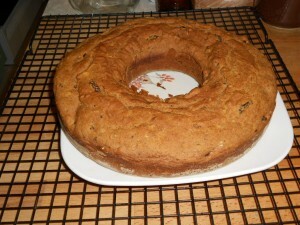 This entry was posted in Desserts, Recipes and tagged applesauce, cake, dairy-free, gluten-free, raisins, walnuts by HSG. Bookmark the permalink. Made this cake again today, but forgot to read my comment above (and hadn’t copied that note to my recipe). This time it wasn’t overly dense, but wasn’t flavorful enough for me . . . so I added a lemon glaze (put 1/3 cup powdered sugar in a small bowl, add lemon juice and/or water 1 teaspoon at a time until it reaches a consistency that you can drizzle over the cake) . . . but wait until the cake is completely cool! Much better now. I now also have a note on the recipe to double the spices next time.